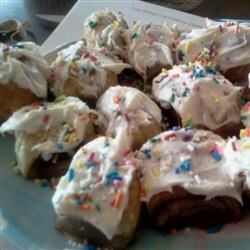 "Extremely easy cinnamon rolls made from a puff pastry." Preheat oven to 375 degrees F (190 degrees C). Spray a 9x13 inch baking pan with cooking spray. In a saucepan, melt butter over medium heat. Add cream cheese, cinnamon, and vanilla to pan, and stir until smooth. Remove from heat, and cool for 5 minutes. Spread cinnamon and cream cheese mixture over puff pastry. Roll puff pastry into a log, and pinch ends together to keep filling inside. Place roll in prepared pan. Bake in preheated oven for 35 to 40 minutes, or until golden brown. Remove from oven, and spread cream cheese frosting over warm roll. Serve warm or at room temperature. Give this easy & fun recipe a spin! I added some brown sugar to the cream cheese filling and didn't use the frosting. Easy and quick. You can microwave the filling instead of using a saucepan to make it even easier. This was ok, not great-isn't a danish or a cinnamon roll, and the result is tasty, with cream cheese icing, but nothing special, or to be made again. This recipe doesn't even deserve a one star. It was in the oven for 3 hours and it didn't cook! The flavor and texture was horrible. Making these rolls was/is a waster of time, energy and money. NOT a cinnamon roll. Definately will not be making these again, sorry.